I really don't feel as if I have too much to say regarding my reading of The Wind in the Willows which I read as part of the Reading to Know Book Club. Stephanie will be here towards the end of the week sharing her thoughts and kicking off a discussion. I'm here to mumble about something in the meantime. This is my third or fourth reading of The Wind in the Willows . I read it for the first time in high school. (Hey! Look! I did get to a classic in high school!) Or maybe it was college. 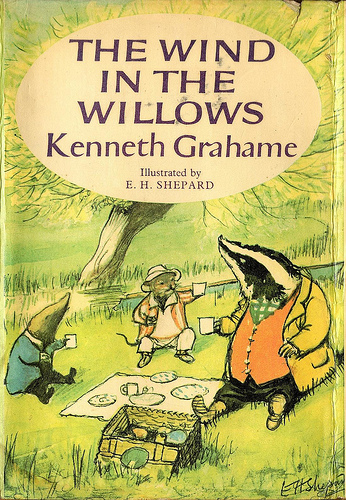 At any rate, whenever it was that I first read it I fell in love with the characters of Moley, Ratty, Mr. Badger and Mr. Toad of Toad Hall. For many years I have planned to read this aloud to my kids. Alas, this was not the year. "Such a rich chapter it had been, when one came to look back on it all! With illustrations so numerous and so very highly coloured! The pageant of the river bank had marched steadily along, unfolding itself in scene-pictures that succeeded each other in stately procession. Purple loose-strife arrived early, shaking luxuriant tangled locks along the edge of the mirror whence its own face laughed back at it. Willow-herb tender and wistful, like a pink sunset cloud, was not slow to follow. Comfrey, the purple hand-in-hand with the white, crept forth to take its place in the line; and at last one morning the diffident and delaying dog-rose stepping delicately no the stage, and one knew, as if string-music had announced it in stately chords that strayed into a gavotte, that June was at least here." Any one of those words by itself wouldn't have been such a roadblock to us but all jumbled together it is a bit much for youngsters, in my opinion. Yes, I could have made them plough on but their eyes were glazing over in Chapter 1 and I don't want to ruin the story for them in the future. I'd rather set it aside and let them at it when they are ready to handle it, instead of make them think it's boring when it isn't. And so I opted just to read it to myself and I enjoyed it very much. As it is a familiar classic (I should think to almost everyone) I'll refrain from describing it. Instead I'll close with some silly quizzes which I periodically like to take for no very good reason whatsoever. I'm not sure what I think of that since I liked Moley least of everyone this read aloud. I liked Badger best! Did you read it/have your children read it/read it aloud to your children? Here's a quiz consisting of 15 questions to see how well everyone was paying attention! 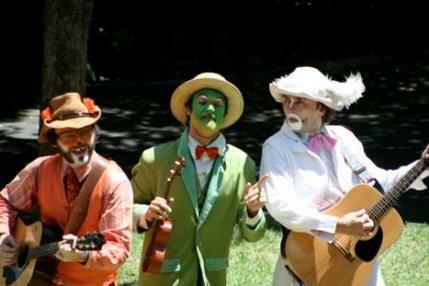 And lastly, here is a picture of some people performing a musical version of The Wind in the Willows which I think looks rather creepy. I'll leave it at that for today. Well, the vocab makes me glad that we didn't find the unabridged version, though we gave up on the dramatization. Meghan inquires about every word she doesn't know, and sometimes Evan does too. I have never read it...guess I need to! Apparently, I'm Badger: "a grumpy old sod with a heart of gold." I read it to Duchess and Deux this year--it was a school literature assignment, so we took it slowly, over three months. It took them a bit to get into, but they really relished it as time went on. Toad is such a scream. The twins eavesdropped occasionally, but definitely weren't up to following the whole thing. This was a read aloud for my 3 children when they were little. They are now 23, 22, and 20 and they still remind me of the "agony" that was this book. Oh well, maybe it should be reserved for older children. My children enjoy the Disney book "Mr. Toad's Wild Ride" which is based on this. It's not literature but it is great fun. I ended up not getting to this one. Maybe some day! I definitely agree that it would be better to wait til the kids can enjoy rather than to force it when they're younger. I agree, too, that I'd rather read "the real thing" when they can handle it rather than a "dumbed down" version. I read this to my kids 3 1/2 years ago when they were 5 1/2 & 2 1/2 (review here: http://linesfromthepage.blogspot.com/2009/12/read-aloud-thursday-wind-in-willows.html). It took a little more perseverance than others, but I remember that they still asked me to read more, pleeeaaase. I think we will revisit it sometime soon. I can't decide if I'd prefer it as a summer or winter read-aloud. I've attempted The Wind in the Willows a couple of times but couldn't get very far for whatever reason. Maybe I need to try again? If that paragraph is a normal one in the book I know why I never read it. My kids really loved this, particularly the older (10, 8, and 7), but my 5 year old also hung with it pretty well. The 2 year old isn't very good at listening to anything yet. I am definitely mole. Most of the time. Although I aspire to be Ratty. I love this book, even though I wasn't able to get to it. I am Ratty by the way. I love the river. What it doesn't have isn't worth having. Sort of non-descriptive but ok.